A possible garage sale find of a pelt of a thylacine has gotten everyone excited over the recently extinct marsupial. 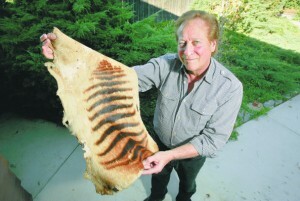 It may or may not be a real pelt of a recently extinct Tasmanian tiger that Bill Warren of Fallbrook, CA, picked up at a local garage sale in June. Even if it is real, though, it doesn’t really get us any closer to seeing a live thylacine, which is the big goal. A self-professed Antiques Roadshow fan, Warren told Sign on San Diego that he picked up the mysterious striped pelt at a sale in June for $5. The woman who owned it had dragged it across the country after buying it at a Boston tag sale 30 years ago. “I didn’t know what it was, and neither did she,” Warren said. But he had a hunch it was something interesting. They settled on $5 and a handwritten receipt of sale. If it is a real pelt of a Tasmanian tiger (Thylacinus cynocephalus) an auction house based in Launceston, Tasmania, says they could get $70,000. The Thylacine went extinct (thanks, Tasmanian white settlers) in 1936. Ranchers killed them off, then the last one died in a zoo. But there have been hopeful sightings ever since. The hotspot is Launceston, Tasmania–yes, that’s where Armitage Auctions is. People also claim to have seen the striped, dog-like marsupial on the Australian mainland, where thylacines went extinct thousands of years ago. French-Australian filmmaker Phillipe Mora, claimed credit in the Sydney Morning Herald: “Collaterally, a dog I had dyed to look like a Tasmanian tiger escaped my motel and for years afterwards sightings were reported of the extinct animal.” I don’t know which is more dubious: sightings of the thylacine or a Hollywood figure finding a way to die a dog’s fur that doesn’t wear off for years, spawning a thylacine frenzy. The San Diego paper lets us know that Warren is a bit of a self-promoter and entrepreneur. When somebody makes a claim to have found a rare, valuable item in an improbable place, that kind of history is not viewed favorably. The real value of a thylacine pelt comes from two things: proof of life or DNA. Everybody wants to see the thylacine alive again. Could it prove that the species is still alive? In this case, no, since it was supposed to have come from Boston in about 1970. If Warren had bought a live thylacine, then he’d be in for the big bucks. Ted Turner offered a $100,000 reward in 1984, but in 2000 told Murray McAllister, a guy who looks for the thylacine, that “the reward is no longer in effect.” McAllister keeps a record of sightings that keep coming in. The other value is in the DNA. The other big hope for seeing the thylacine alive again is through DNA resurrection, ala Jurassic Park. But so far all the known samples in museums have been too ragged. It’s unlikely a garage sale pelt will yield better samples.